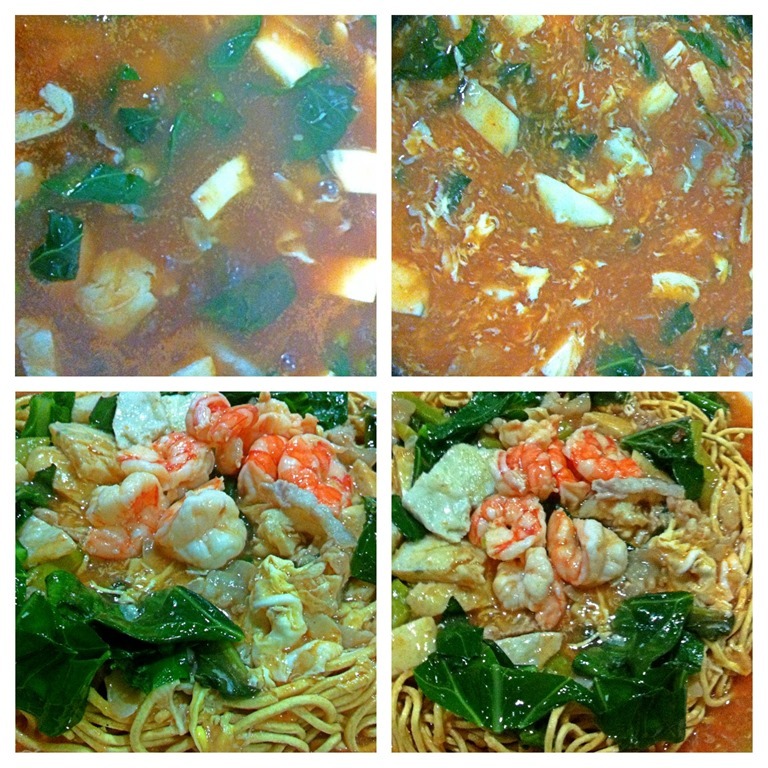 Today’s dinner, i have cooked the a noodle dish which is a fusion dish between the famous Sarawak tomato noodles and Kuala Lumpur Style fried Noodles (Cantonese Yimin). The main difference between the two is the gravy and type of noodles. Since I have nothing much to comment on what I cooked today, I have decided to have my cooking illustration in this post. 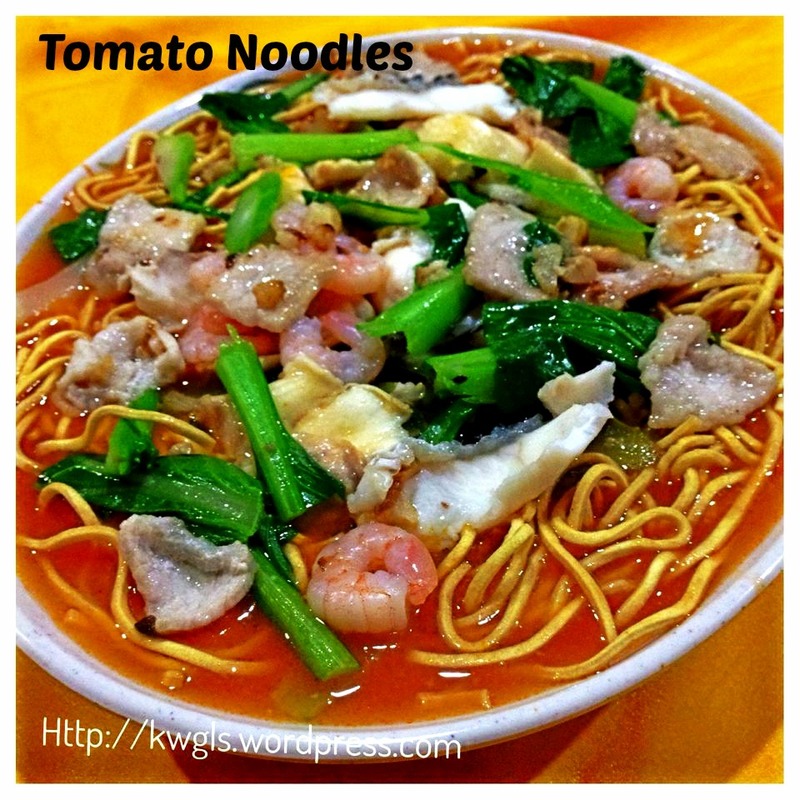 In Kuching, Sarawak, Malaysia, the tomato noodles are a type of egg noodles, deep fried and soaked in a gravy made from tomato puree and sauce. The gravy is clear and orange in color. 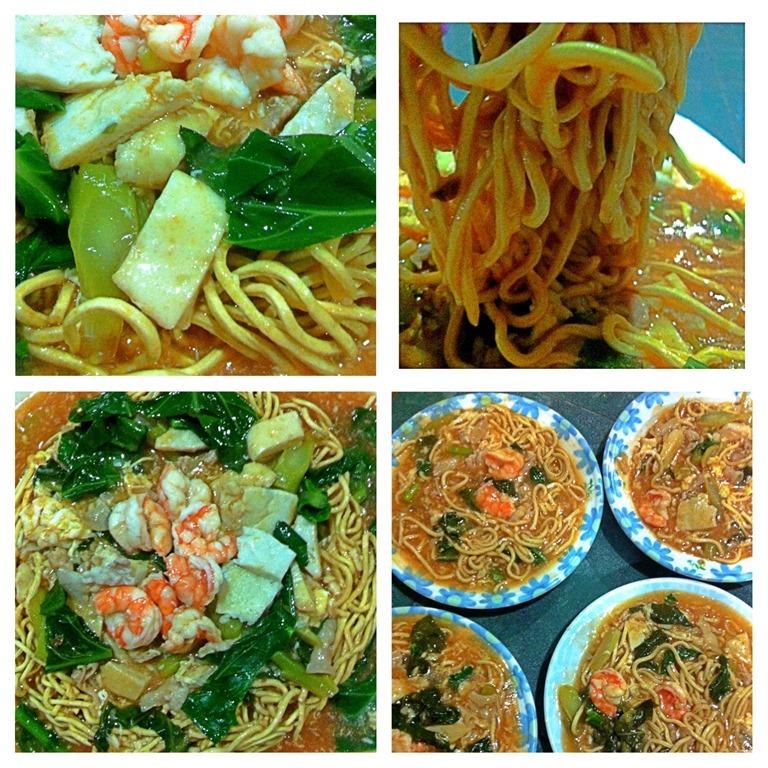 In Kuala Lumpur, Selangor, West Malaysia, there is another type of Cantonese noodles, called Cantonese Yi Min, a ready made deep fried noodles and soaked in a clear whitish egg gravy and cooked with seafood and meat. The uncooked Cantonese Yimin is like the picture below and I bought it in a Singapore provision shop that sells other types of Chinese dried goods. 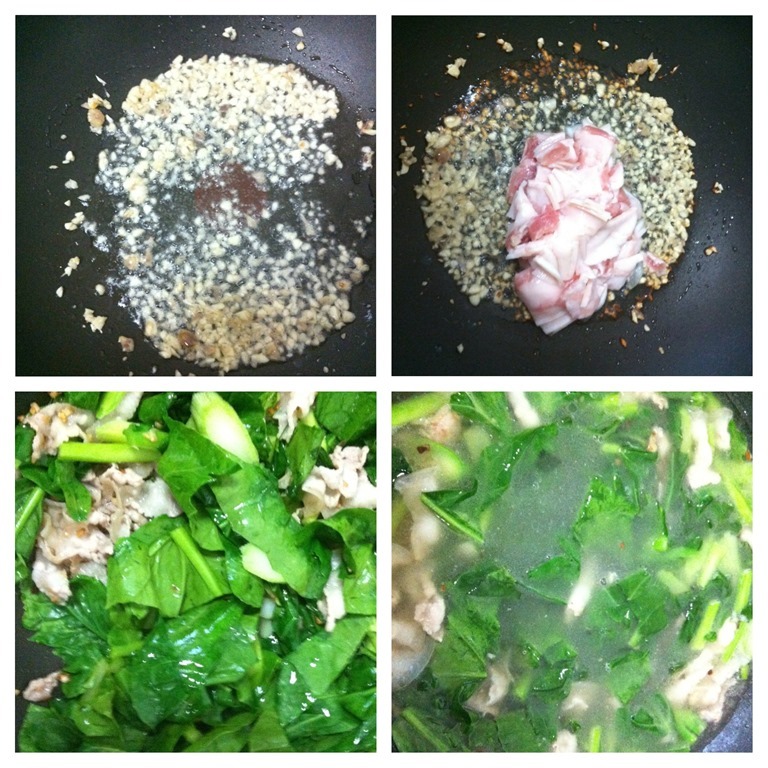 Most if not all ingredients except the noodles (Yin Min) are substitutable to your liking. Measurements is for reference and for cooking a meal of 2 adults and 2 kids. Pinches of salt and 1 tablespoon of sugar. 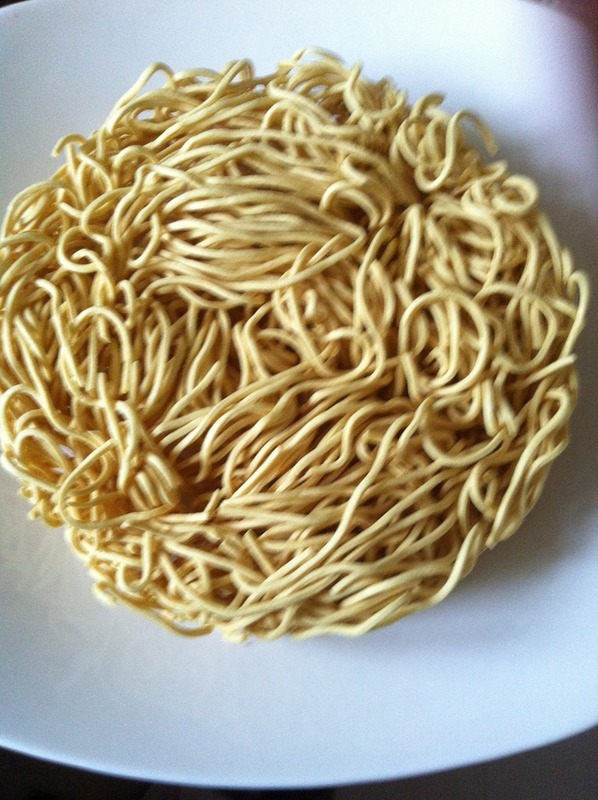 In a big and dip plate, placed your noodles in the centre. In a small mixing bowl, place tomato paste/puree and corn starch, add half cup of water, stir until well mix and set aside for later use. Your tomato starch solution should be orange creamy in colour. You can also add the seasonings of your choice at this point of time). In a hot frying pan, put 3 tablespoon of oil, fried the chopped garlics and shallots until golden brown or until aromatic. Add 1.5 cups of hot water to the pan and bring to boil under high heat. Add in tomato starch solution and bring to boil. 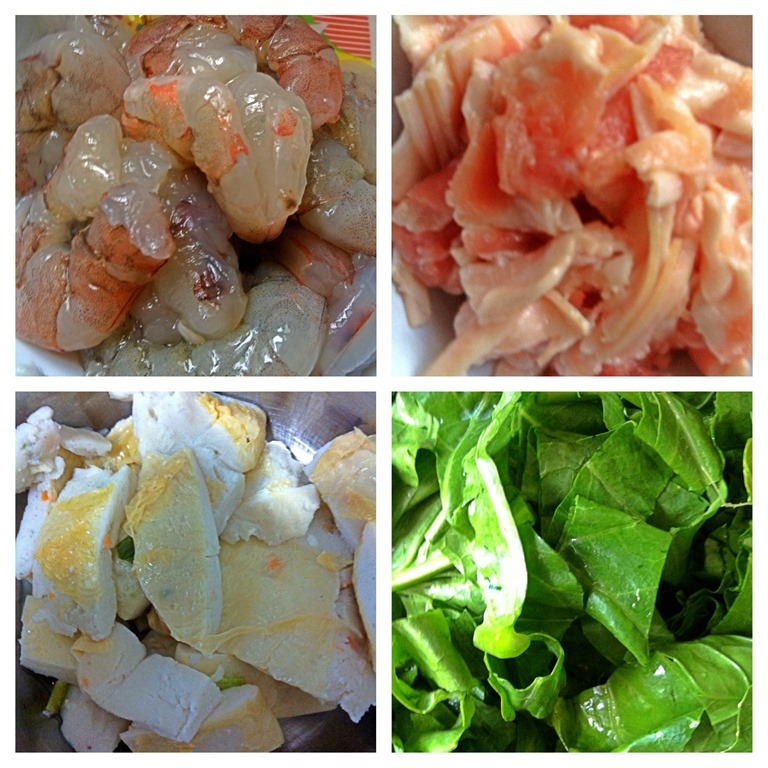 Add in the prawns, beaten eggs. Pour your beaten eggs slowly into the boiling tomato gravy, use a chopstick of fork to slightly make a circular motion in the gravy such that the egg will be broken into tiny pieces in the gravy. Add in vinegar, sugar, salt and any other seasonings that you like (e.g fish sauce, light soya sauce, mushrooms concentrate, pepper etc.) and bring to boil. Once boiled, slowly scoop out your gravy and pour on top of the noodles. 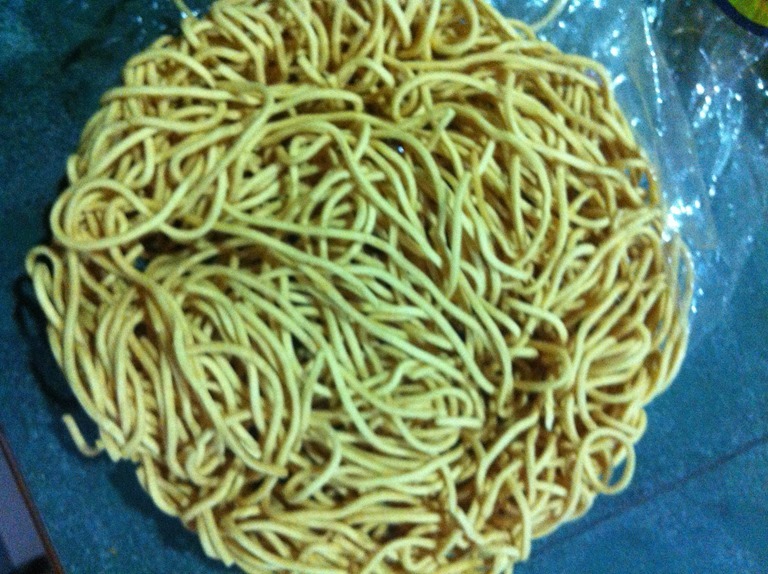 The noodles will gradually soften. You can prepare your gravy first and pour on the noodles only when you want to have your meals. Let it soak for about 5 minutes before putting it in separate plates for individual servings. This will help the noodles absorbed the gravy making the noodles tastier. Serve hot in individual plate. This is the first time I published a cooking illustration in “What I cooked today series”. Cooking illustration that are less complicated will be published in this blog’s sister Facebook Page – Guaishushu’s Page. Please refer to this page for simple cooking illustration for daily meals. 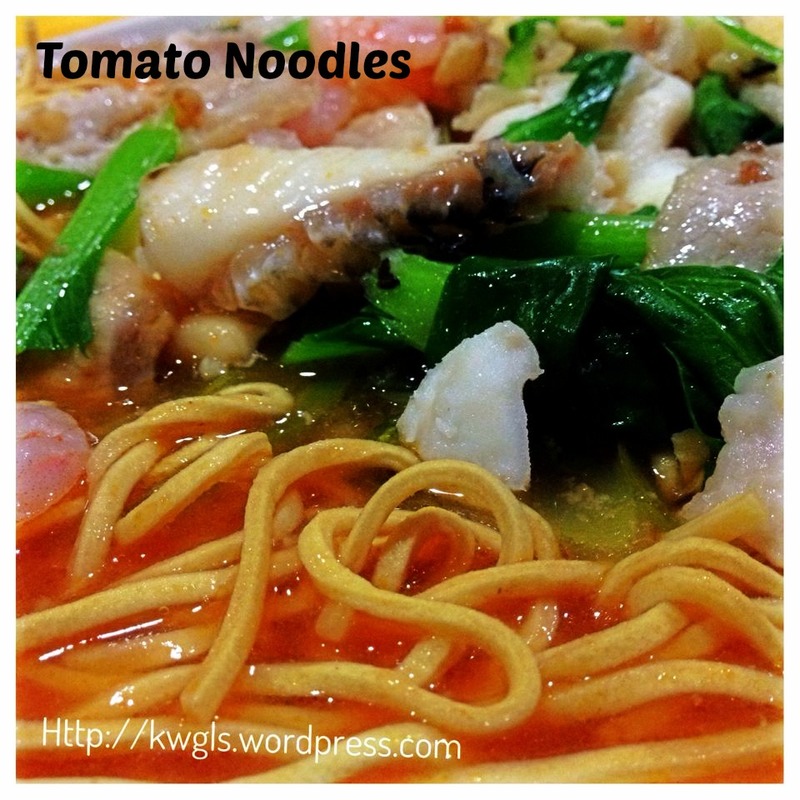 This noodle is neither the famous Sarawak tomato noodles nor the famous Cantonese Yimin noodles. It is a fusion of the two. 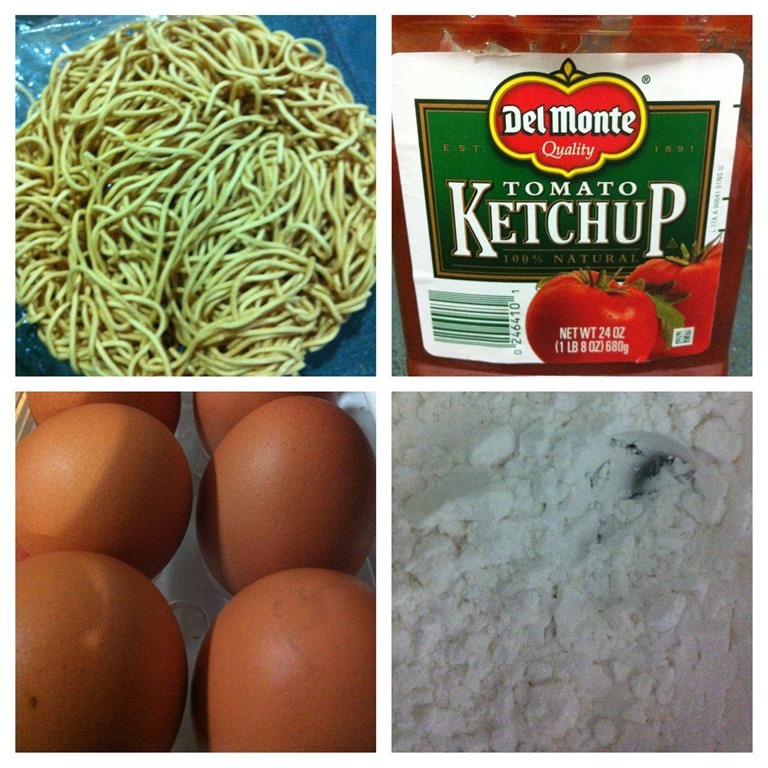 I have used the Cantonese Yimin noodles and soaked in tomato egg sauce. The end product is better than I expected. 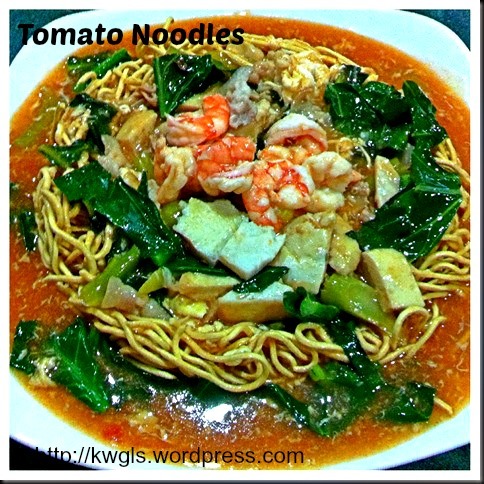 As the Cantonese Yimin noodles are coarser, they are able to absorb more gravy making the noodles tastier. 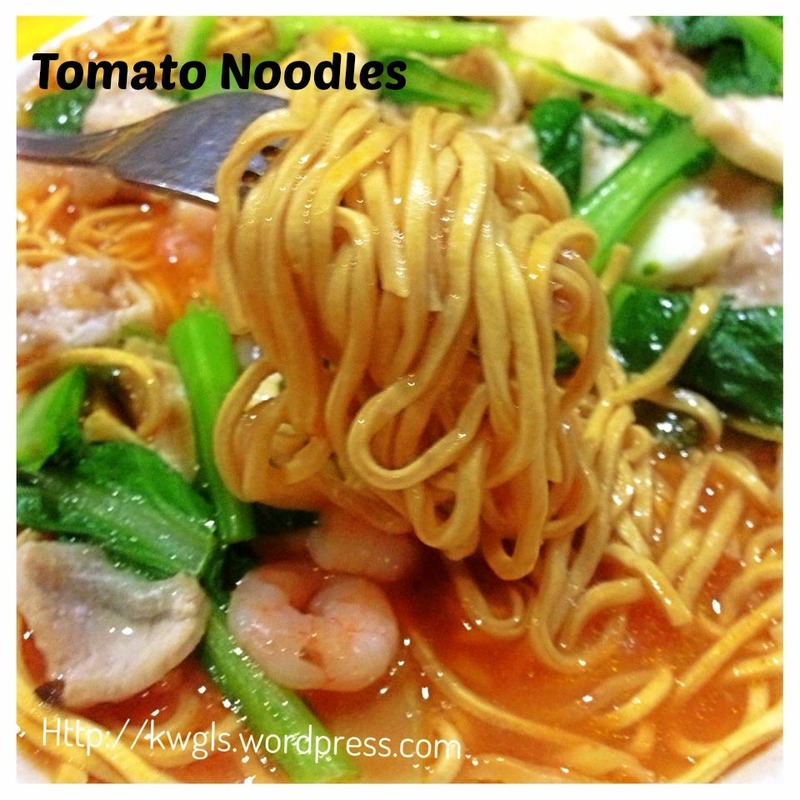 The texture of the noodles are better and will not break too easily as compared to the Sarawak tomato noodles. As for non-Asian readers, shall I call this Asian Style spaghettis? 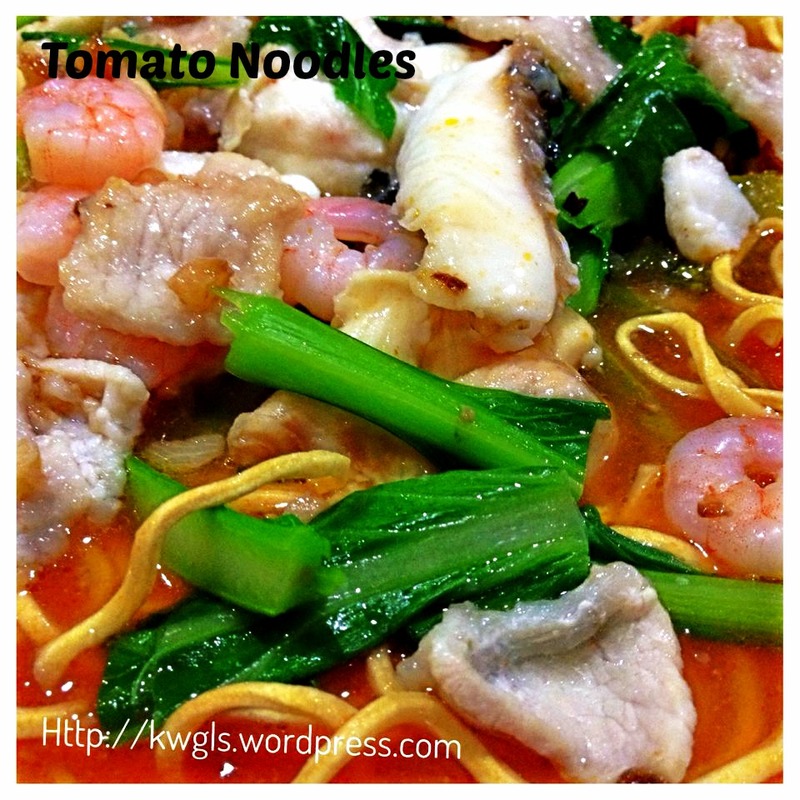 You will like it as the noodles are soft and smooth with tomato fragrance. Hope you LIKE the post and let me know after you try out the dish. This entry was posted in Dish, What I Cook Today Series and tagged 11, 8, adults, Asian, Authentic, Cantonese, Cheers, Chinatown, CHINESE, Clear, CONCLUSION, corn, courtesy, cups, cuttlefish, diameter, difference, dinner, dish, enhancers, Facebook, fragrance, Fresh, fusion, garlics, goods, grams, Gravy, GUAI SHU SHU, Guaishushu, homecook foods, Hope, illustration, ingredients, kenneth goh, Kuala, Lumpur, malaysia, measurements, Meat, Most, noodle, noodles, Once, Page, Pinches, pork, postaday, potato, Pour, preparation, product, provision, readers, Ready, reference, sarawak, Sauce, Seafood, Seasonings, Selangor, Series, Serve, servings, shallots, singapore, solution, starch, STEPS, Style, tablespoon，postaday, texture, Tomato, tomato noodles, tomato Yimin noodles, Type, Vinegar, West, Yimin. Bookmark the permalink.